If you are in the Bay Area and have spent any amount of time near the San Francisco Embarcadero, then you know that the America’s Cup is upon us. This is a very exciting time to be in San Francisco. 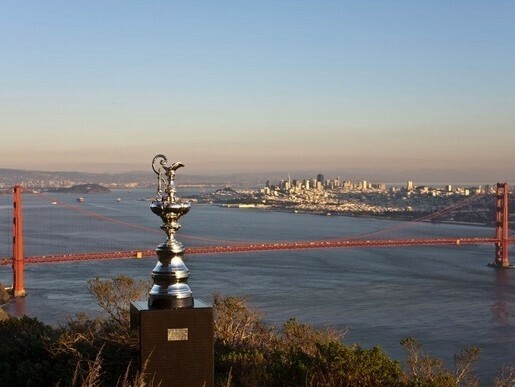 The America’s Cup is the oldest active trophy for international competition and is awarded to the winner of match races. This year, the Challengers, Artemis Racing of Sweden, Emirates Team of New Zealand, and Luna Rossa of Italy, will compete in the Louis Vuitton Cup for the opportunity to face defending Oracle Team USA. While the actual America’s Cup race will not run until mid September, there will be plenty of races to watch throughout July and August to determine the Challenger. The America’s Cup offers many events for sailing enthusiasts and casual fans alike. July 4, 2013, marks the official opening day with a ceremony at the America’s Cup Park. The Park, which has been host to the America’s Cup Concert Series, will be packed! The ceremony starts at 3pm and tickets are selling quickly. At only $10 each, get your ticket to be a part of this momentous occasion. The opening series on Friday, July 5, if you want to get a closer peak at the competitors. The racing for the Louis Vuitton Cup begins on Sunday, July 6, 2013 with Round Robin Racing. With the speeds of the larger boats and the winds of the bay, these races will be short yet action packed. The Louis Vuitton Cup runs through August 30, giving you plenty of options to catch a race during the lunch hour. For a complete schedule of races, visit the America’s Cup Website. The America’s Cup Healthy Ocean Project (ACHOP) creates awareness around the problems that face the ocean and inspire individual action around the solutions that exist. The ACHOP has three core issues that they focus on: Sustainable Seafood, Marine Protected Areas, and removal of Marine Debris/Plastics. Sign the pledge to only eat and buy sustainable seafood, or choose to dine at restaurants that have been approved as sustainable seafood vendors. There is a wonderful mobile app from the Monterey Bay Aquarium to help make choosing sustainable foods easier. If you missed the recent round of beach cleanups with members of the racing teams, its not too late to pitch in. There are three beach clean up mornings scheduled during the races. For a list of dates and locations, visit the Healthy Ocean Project’s Beach Clean Up page. For those of you interested in committing long-term to keeping plastic out of the oceans sign up with Sea Scavenger! Volunteer every second Saturday, monthly, from 10-Nooon – year round! Clean ups take place on the shoreline primarily between AT&T and Candlestick Park – followed by refreshments at local pubs. The Legion of Honor, a Fine Arts Museum of San Francisco, has an entire exhibition dedicated to the Masters as Yachtsmen. This exhibition is on display through the running of the cup and is a beautiful expression of sailing and art. Over the course of the next 75 days, the world’s top yachtsmen will be competing in the race of a lifetime. Dive in and enjoy all the festivities and the spirit of competition during the 34th America’s Cup. There is, one knows not what sweet mystery about this sea, whose gently awful stirrings seems to speak of some hidden soul beneath.